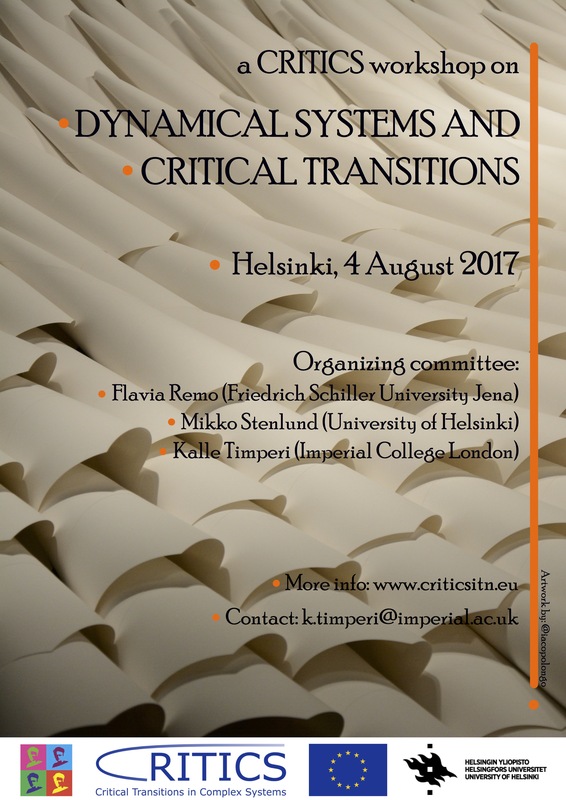 The CRITICS Workshop on Dynamical Systems and Critical Transitions, organized in collaboration with the University of Helsinki, will be held on 4 August, 2017. The venue for the event is the Exactum building in the Kumpula campus of the University of Helsinki. Application to real-world complex systems in ecology, climate science, technology and financial markets. The program (featuring abstracts for five of the talks) can be downloaded from the following link: CRITICS Workshop program. The workshop is free of charge for all participants, but those who wish to take part in the optional evening program will need to pay a 20 Euro participation fee, which covers the sauna expenses. A certificate of attendance will be provided for all registered participants. In order to register, please send e-mail to k.timperi@imperial.ac.uk.